I’ve been googling around the internet and have come across a few more interesting CS-related resources to share, eventually I’ll link to them in Resources, but for now, they’re here. Eventually I hope to figure out a better way to catalog these so I don’t get duplicates! Mary Baker Eddy and the Neo-Vedantic Origins of Christian Science: Its influence on New-Age thinking, and fundamental misunderstanding Peter Holleran. 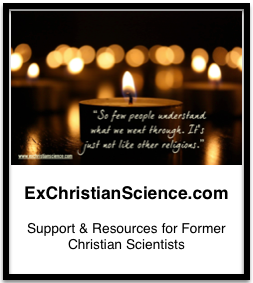 The Christian Way – although I disagree with their over-all message of “finding Jesus” they do have an impressive resource list. Are there any other books, articles, blogs, x/former-CS support groups or other resources I should include? As a general rule I’m trying to avoid the “CS IS A CULT!! !” fundamentalist groups (Christian Way being an exception because their members are former CS). Terrific! Keep adding to this! I’ll be totally honest, I haven’t read all of it, but I’ve skimmed most of it. To be included, it has to be thought provoking and not just go off on the usual “CS is a cult” or “CS kills” or “CS is a lie, find Jesus” themes that are so popular. Every few months I google around and see what new things have popped up and I search around on wordpress as well – that’s how I found your blog. .The concept of cults is totally fearful on the part of those who look for them. .CS does not kill, practitioners sometimes make terrible choices out of ego instead of pragmatism. Eddy herself, was always pragmatic when it came to her own health. One should not try to practice beyond one’s ability and others should mind their own business about choosing outside interventions. Babysteps are babysteps and one thing is certain, people grow and grow and grow from babyhood. .Something about her method has always appealed to me when she is claiming God is Love (or Truth or Whatever), but she was very muddy about mortal mind and has taught people to fear it. AM is even worse. These were not inspired by Love or Truth, but by fear of failure and excuses. She is missing a piece somewhere, but the way she made it impossible to test hypotheses and analyze what worked and what didn’t, by the structure of her by-laws, I think she has relegated the church membership to the graveyard, and it is the Library through which people will be arguing about her for a long time. She is missing something that allows success to build on success and instead, allows failure to drive people to their deaths or leaving. People need to build on what she brought to the table. And to do so, they must be able to use new terms and even concepts. BTW I just read the Hindu resource. I always take a left turn when they say one must prepare themselves in such and such a way to get to here or there. They have a great metaphor for Reality, but it is still a metaphor. Other metaphors work just as well.